New Liturgical Movement: St Abraham the Patriarch, October 9th - Do We Commemorate Old Testament Saints? 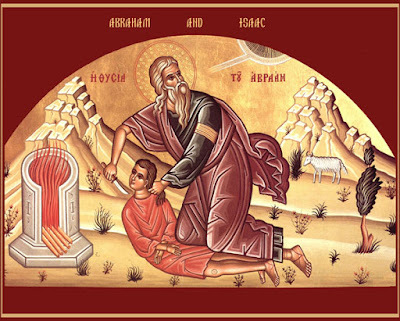 St Abraham the Patriarch, October 9th - Do We Commemorate Old Testament Saints? 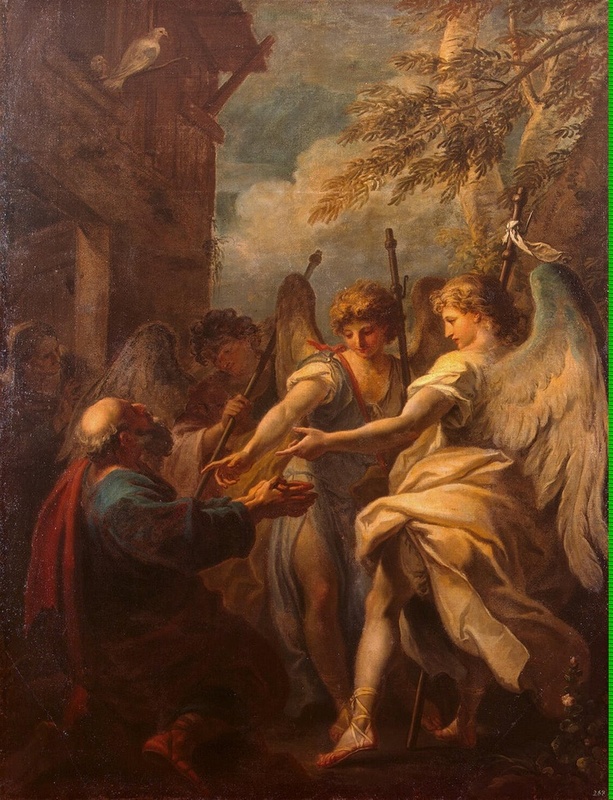 It is common for the Saints of the Old Testament to be commemorated in the Divine Liturgy of the Eastern churches, and the Patriarchs and Prophets are commonly patrons of churches, and referred to as Saints. 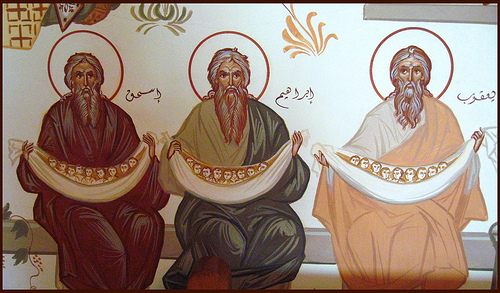 Here is a fresco in which three patriarchs Ss Abraham, Isaac and Jacob appear. These might be life-size on the wall of the church, so that one would get the impression that these figures are praying the liturgy with us. I started to consider this because this is the latest in the occasional series about images of the Saints named in the Roman Canon, of whom Abraham is one. I realised as I did so that I can't remember ever being present at a Roman Rite church where there was such a commemoration. Perhaps it is time for this to change? Is there a Roman Catholic Church of St Abraham anywhere? Please let me know! 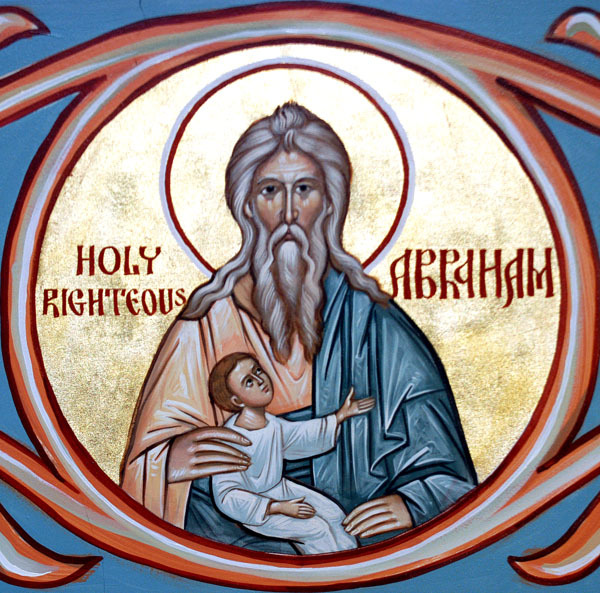 This is not the only daily liturgical reference to Abraham. He is referred to in the Gospel canticles sung daily at Lauds and Vespers, the Benedictus and the Magnificat, and in both of them he is called “Father.” There could be a incensing of his image during either of these on certain days. The place of the Patriarchs of the Old Testament in salvation history is, as I understand it, that of establishing the practises of faith. 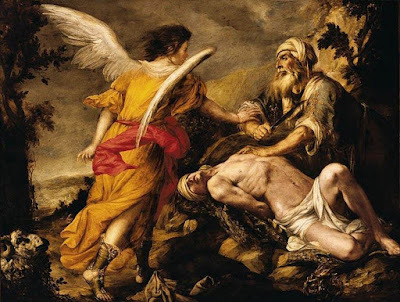 In this sense, Abraham clearly has a place in the establishment of liturgical tradition through his being prepared to sacrifice his only son, and ultimately sacrificing a ram. Here is an image which might be appropriate behind the altar in a church, a 6th century mosaic from Ravenna in Italy. It connects the sacrifices of Abraham, Abel the Just and Melchizedek with the Mass in ways both obvious and subtle. 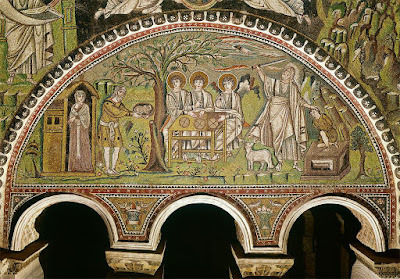 First the obvious: it connects them with the Mass by placing them in a church and clearly setting Melchizedek’s offering of wine and bread on an altar in greater prominence. The artist tells us directly who they are by writing their names in the picture, something that artists today should perhaps think about. Don’t make the symbolism or connections mysterious; tell us who the people are in writing. If there is an appropriate biblical reference that clarifies things, then write that in the picture too. The more subtle connection with Christ is the placement of the eight-pointed star on the front of the altar, indicating that the altar itself represents Christ, and the eighth day of Creation, as His Resurrection is celebrated on the eighth day of the week, Sunday. 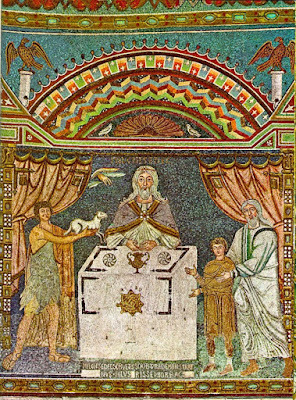 Another mosaic from Ravenna has Abraham as the theme. 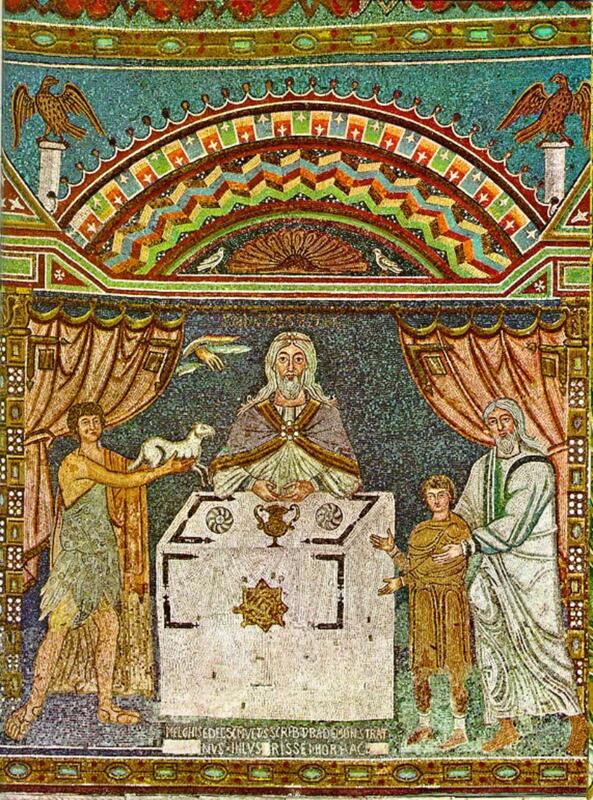 In this we see a depiction of the sacrifice again, but also the scene known as the Hospitality of Abraham, Genesis 18, 1-15, in which he welcomes three strangers. 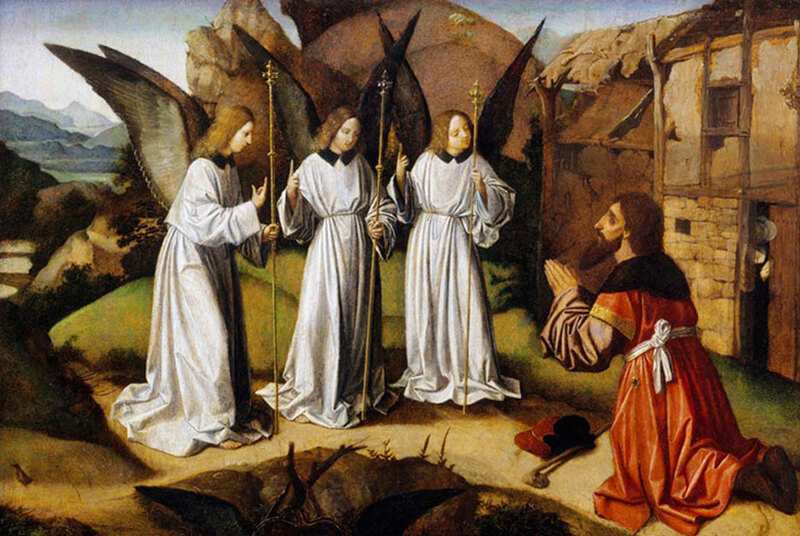 They are three angels under the appearance of men, traditionally seen as symbols of the three persons of the Trinity. This second theme is also the subject of many famous paintings. After an Eastern iconographic depiction, which will be familiar to many through that of Andrei Rublev, I give two Western images. The first is 16th century Italian, the second 15th century Flemish. And here are some more that highlight the sacrificial theme, iconographic and Baroque in style respectively.